Posted on August 7, 2018 by Emily Allbon. Wow! What an invigorating day and a truly memorable and exciting experience! 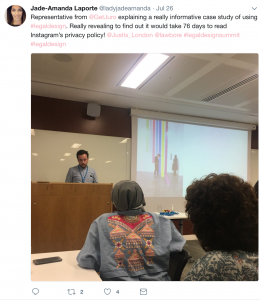 Of course as I write now I have the benefit of hindsight, so let me rewind to those moments beforehand when I had absolutely no idea what to expect when attending the Justis Legal Design Sprint. 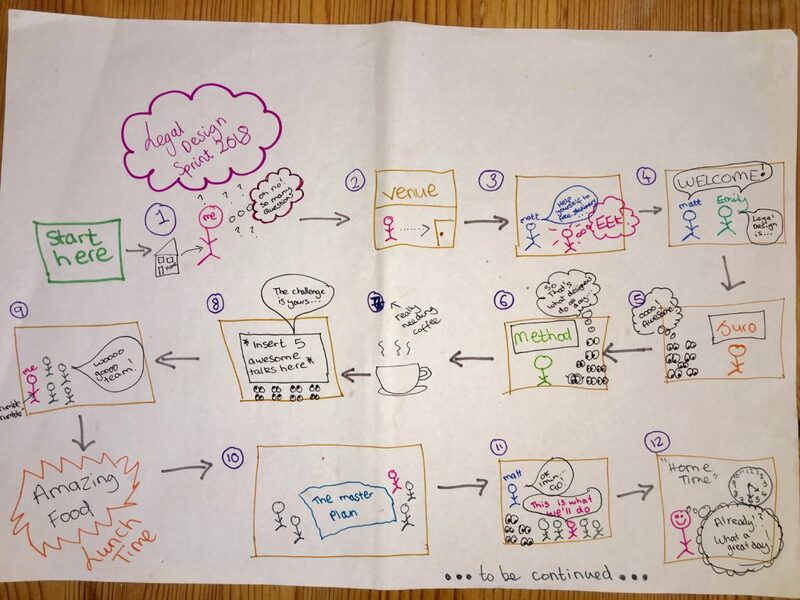 On the early morning of the day I had so many questions revolving around in my mind; not least because ‘Legal Design Sprints’ are not something we have ever had before in the UK, so I had no precedent with which to draw my first impressions! 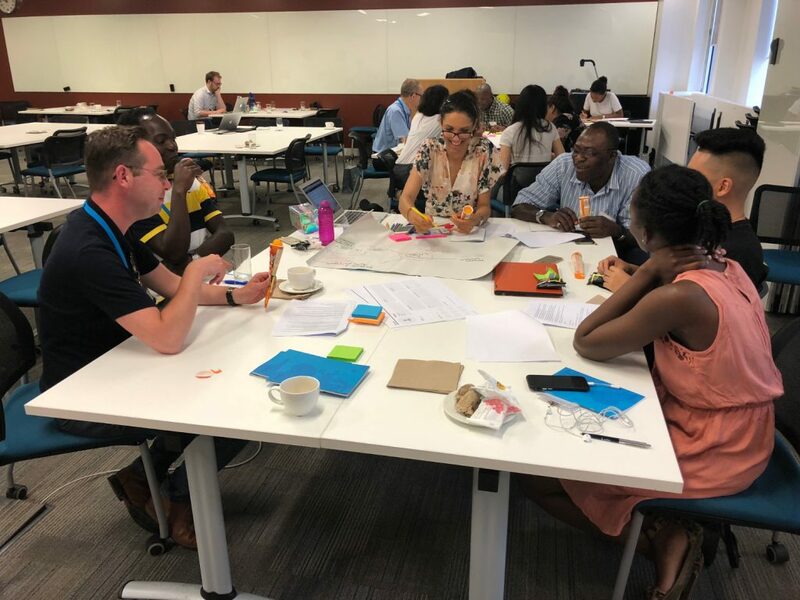 First, the word sprint made me think of speed, would we have to design something at a really fast pace, on the hottest day of the summer so far? – sprinting was not a favourable thought; Second, the word design had me in a stir! I absolutely cannot draw anything beyond stick men and I would not call myself a designer by any stretch of the imagination; Thirdly, Legal well, exams were a long time ago and I had relocated all of my revision to one very buried place at the back of my mind; And finally, what if lunch was really awful? Small detail, I know, however I hadn’t had breakfast at this point due to the early commute and a few sandwiches and a packet of crisps, the usual conference spread, was simply not going to satiate my appetite. So feeling very unsure, I took my newly acquired set of coloured pens and some A3 paper (just in case) and set out on my journey to the heart of the city of London for the Legal Design Sprint. Well, when I arrived at the venue, all of my questions were very soon put at ease. There was not a face in the room that I recognised which was daunting, however they were all smiling and seemingly friendly faces and so I felt less anxious walking into the unknown. I entered past the most inviting spread of coffee, juices, water and a scrumptious platter of fruit and was greeted by the very calm-natured and friendly Matt (co-host from Justis) at the door welcoming me to come in, signing off my name and telling me I could ‘help myself’ to any of the stationery on the table beside him! You should have seen the look on my face for my eyes surely did light up! 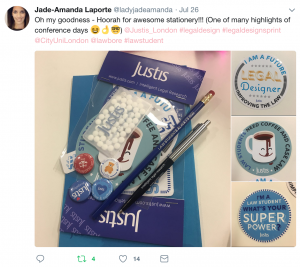 ‘I don’t mind if I do’ I thought, as I saw piled high stacks of post-it notes, notebooks, chunky markers, pens, pencils, badges, stickers and many an item with the slogan: ‘law students always win’. I felt like a small child in a candy store! After sitting at a table and discovering that many others in the room were also law students from all different backgrounds and ages the conversation soon slipped into the usual law student introductory chatter and it began to feel very much like that before-university-lecture feeling. Then the talks began! The aforementioned Matt of Justis introduced the Legal Sprint event by outlining an agenda for the day – thankfully no physical sprinting involved! I was very intrigued by the wide-ranging and diverse list of speakers for the day and before I had time to ponder (or Google) more about each of these speakers, Emily Allbon, the star that brings us Lawbore and joint organiser of the event, began by introducing us to what Legal Design actually means, how it originated and gave us a run-down on why it is important, whilst also giving us a who’s-who on some of the key people and leading pioneers of the Legal Design movement. 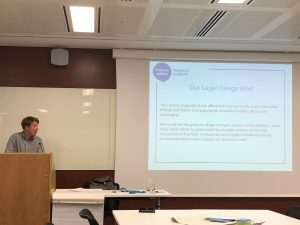 Next, we had a really thorough account from Method, international design professionals, who showed us step-by-step the stages that a designer goes through when working in teams, demonstrating to us the legal design methods (pun fully intended!) and techniques that we might like to use, I was introduced to so many new apps and creative working tools to help organise my ideas. This was useful to know not only for this project but for wider organising activities that I often find myself apart of during my studies and outside projects. Before now, I had no idea just how much thought and process goes into each detail of the design process and I was raring to see how I might use these methods in practice. After a refueling coffee break we were delivered a series of very inspiring presentations on various problems that were to be the challenges that we would work on throughout the day. We heard representatives from a wide range of fields, everything from Citizens Advice Merton & Lambeth, Browne Jacobson solicitors, the University of Nottingham to the Incorporated Council of Law Reporting and even Jisc (the creators of eduroam!) whom all had a problem to set for us to solve. As soon as the talks were over our team could hardly wait to bite into our problem! Teams were formed by very subtly having had a particular word pre-printed on our name badges which, when discovered, was a huge relief from the often awkward moments of ‘picking teams’. I opted to be team scribe to jot all of our ideas down. Before long, we were subsumed by large web diagrams on the largest paper that filled the table (My A3 paper save to say was engulfed many times over!) We were only interrupted by mention of lunch and our hungry stomachs. When everyone walked into the lunch room, myself and newly made friends were most surprised and relieved to see a delicious cooked buffet lunch that awaited us! There was something for everyone, delicious fresh fruit, salad, a chilli dish and a goats cheese and pasta dish – definitely food for thought. After a very pleasant re-fuel and another opportunity to get to know each other better over lunch we were ready for part 2 of the day. Following some more wise words from Method, it was lights, camera, action! And away we went with ideas spraying in the air like fireworks, colliding into each others and making a beautiful work of art, we worked together filling out our worksheets and beginning to develop our ideas using our new-found knowledge, techniques and inspiration. Suddenly it reached 4.30pm and after we had given short 1 minute presentations on the foundations of our project, I could hardly believe the day had gone so quickly. Jade-Amanda delivering the presentation for #TeamConsumer! I was buzzing with enthusiasm and excitement having learnt so much, heard from so many interesting people and having made so many new friends in such a short space of time. They say that ‘time flies when you are having fun’ it really did and it really did turn out to be a Legal Sprint! However fortunately it was my imagination and creativity that was running and not my very weak legs! Thank you so much to Emily and Matt for putting together such a very well organised day – I can hardly wait for Day 2.